THE HEROESONLINE BLOG | REMINDER :: HEROES DISCUSSION GROUP: THE DEATH OF SPEEDY :: THIS SATURDAY! 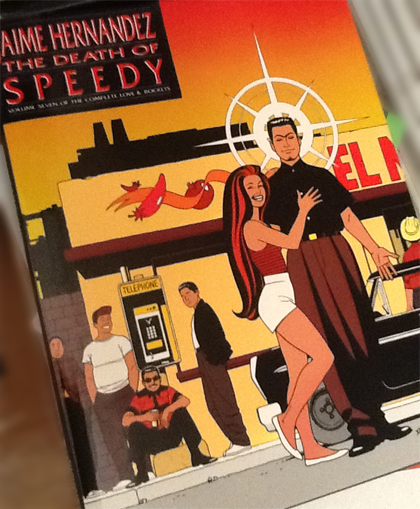 REMINDER :: HEROES DISCUSSION GROUP: THE DEATH OF SPEEDY :: THIS SATURDAY! In 2000, The Comics Journal published a list of the Top 100 American Comics of the 20th Century. Coming in at # 24, 22 and 17 are three works by Jaime Hernandez. Originally published in the Comic Magazine Love and Rockets in tandem with the comics of his superbly talented brother Gilbert, these three selections, Flies on the Ceiling, The Death of Speedy and Wig Wam Bam represent some of the most influential and critically lauded comics of the past few decades. For those of you who have read Jaime’s work, you know what to expect—wonderful art and rich rewarding story-telling. In other words, it is sequential art at its best. For those of you who are reading for the first time, I envy you. One suggestion—read it slowly. The fresh, clean line art and simple page construction makes it easy for the reader to fly through each page. When you catch yourself sailing through, take a step back (or look again), as there is a lot there. The fact that Jaime makes it seem effortless is part of the comic’s charm. The Girls from H.O.P.P.E.R.S. is available from Heroes for $14.95 and don’t forget the Heroes Discussion Group 10% Discount—you must notify the clerk about the discount when you check out. Note: for anyone reading the stories in the LOCAS HC collection, start with House of Raging Women and continue on through Below My Window Lurks My Head.